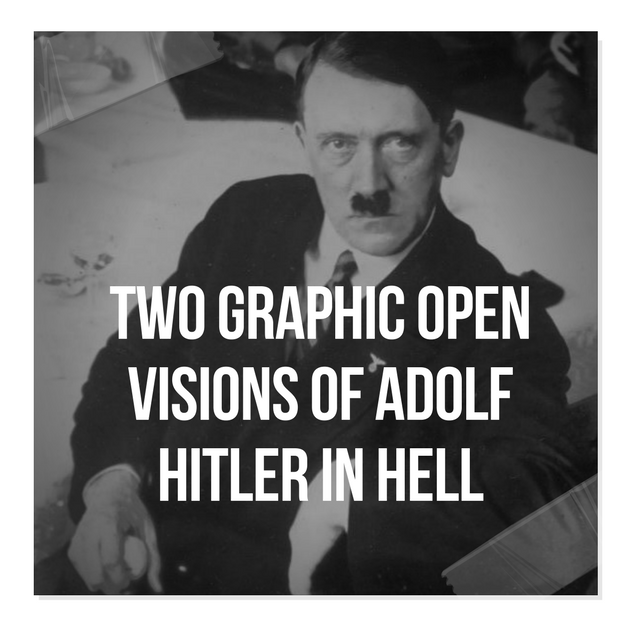 The first vision started when I first saw Hitler’s face, as he was standing in a pit. The first thing I noticed was that he had such a look of anguish and despair upon his face. He looked like he had been there for thousands of years, even though it was not that long ago when he died. I knew in my spirit that he knew that there was absolutely no hope for him. That he would be tormented here, and then the lake of fire for all eternity, because he opposed obeying Jesus. And also chose to commit genocide of the Jews. He did not repent and turn from his sins. Also God says in his word that the he will curse those who curse his chosen people, the Jews. The pit Hitler stood in was about 6-7 feet wide, and about 5 and a half feet deep. It was quite dark in this part of hell we were in. The ground was dry and cracked. It looked like a large cave. Then suddenly the ground in the pit, opened up partly, and flames shot up from the bottom of the pit, and engulfed Hitler’s entire body. He let out a blood curdling scream as soon as the first flame hit. He shook violently, and convulsed, from the agony of the fire. I saw thick, dark, billows of smoke issuing from his burning soul. He could not stop screaming. He tossed his head back in pain, as I saw his flesh was melting away. First his hair and skin caught fire. His flesh began to turn black and and shrivel up into clumps that fell to the bottom of the pit, and continued to burn. His facial bones began to be exposed through burning flesh. His hair caught fire like a match stick, and was disintegrated. His eyes burned also, exploding and dissolving in their sockets. Most of his body started to pour out extensive amounts of dark blood like a faucet, as it oozed down the ribs of his now exposed skeleton. Thick balls of black smoke dispersed from his rib cage. Now his skeleton started to burn and he could not bear it none whatsoever. He continued to scream, as he tossed back his white skull in agony, shaking back and forth, his bones rattling, and his jaws gaped wide open. He could not scream as loud as he wanted to, because the pain was exceeding great, and took all his attention. This all took place in just a few seconds. The hell fire was exceeding great. But it didn’t stop there. His skeleton continued to burn with fervent heat, and I watched as his skeleton became charred and started to crumble and Hitler was turned into a pile of dark ashes at the bottom of the pit. Then the fire went back into the ground at the bottom of the pit. Then the pile of ashes started to come together again, and reform, until rapidly they formed into his skeleton, and pink flesh started to grow and knit together upon his bones. In seconds his body had completely been put back together, and he stared at me once again with very depressed and hopeless looking eyes. Just when it seemed he would have a rest, he was given no rest. In seconds, the flames returned yet again. The torment began. So did his screams. This man will never have rest. Then after his body was formed again for the second time, he had the same depressed look on his pale face. But this time he was allowed to speak to me. He does not speak english, so the Lord Jesus Christ supernaturally translated his language, so he was speaking to me in english, and vice versa. Then Hitler looked away, at something behind me, and his eyes opened wide with complete terror. He looked helpless, and was helpless, as he screamed and held up his hand in order to shield himself. But it did him no good. Suddenly a hairy, tall, slender looking demon with large bat like wings, swooped down on him with a screeching noise, as Hitler trembled with fear. He opened his mouth wide and screamed, as tears began to well up in his eyes. The demon flapped it’s wings and reached down with it’s slender bony hands. It snatched Hitler out of the pit and flew with him up above. The demon had a gruesome face like a bat, with a slanted snout, jagged teeth, and high, and pointed ears. It held Hitler up in mid air with his hand around his throat. Hitler began to cry, cry, and cry. He was as a small child. He was a ruthless dictator on earth, but now helpless and begging for mercy from his torturer. The demon began to beat him and strike him upon his head, shouting at him. “Didn’t I tell you there’s no forgiveness? How many times do I have to stab you for you to get it?”The demon said. Then it took out a long silver spear, as Hitler pleaded with it to stop. But it paid him no attention and had no mercy at all. It took the spear, turned Hitler to the side, and stabbed him in his lower back. Hitler couldn’t do anything about it. The demon did not stop, and proceeded to drive the spear in even deeper. I watched in as it viciously drove the spear in more, and it finally coursed through his stomach. Blood gushed out and it fell to the ground below. Then the demon hoisted Hitler up on the spear with tremendous strength, and dropped him to the ground as if he was trash. The demon donned a rugged smile, as the long end of the spear embedded into the dry ground, Hitler dangling on the spear, above the ground. Then almost instantaneously as he fell, the ground below him opened up the same way as the pit had, and the flames came back again. Hitler, still impaled, was engulfed in a great ball of fire, as I heard his piercing screams one more time. Then the vision ended. I was also shown a different vision, where I saw the same demon from before torturing Hitler. Hitler was covering his head on the ground, as the demon began to beat him over and over again. Then the demon reached down and grabbed Hitler’s head, and began to twist and twist until it was ripped completely off. Hitler’s lower body fell to the ground. Then the vision ended. I explain this to you, brothers and sisters, not to scare you, but to warn you. Jesus still loves Hitler to this day, and forever, because Hitler is still his creation. Jesus created Hitler to love, serve, and worship him. But Hitler chose not to repent, but to rebel against the Lord and disobey him. So the Lord sent him to hell, where he is at this very second. Please, Please, Please do not join the billions of people being tormented in hell. What I saw in these visions were a part of hell, not all of it. There are different levels of torment in hell for different types of sins. For liars who did not repent and turn from their sins, there is a specific place of torment for them in hell. It is the same for Fornicators, Adulterers, Slanderers (I will share my own experience of this another time), Murderers, those who commit suicide, and all sin. No sin is forgotten in hell, and the demons there will remind you of your sin constantly as they torment you. Or even the devil himself may torment you. The Lord has allowed me to encounter the devil as well in that dreadful place. Please let’s take this very seriously and examine ourselves, to see if we are right with the Lord. Today is the day of salvation. Repent and be baptized, so you can receive the Holy Ghost. Read the word of God daily, living and obeying the scriptures. Jesus loves us, but will not spare us in his wrath if we choose not to repent, turn away from our sins, and obey him. If there is any sin in your life, please repent and turn from it. Ask the Lord to help you stop if you cannot. If you are really serious about him, the Lord will help you to overcome it and will deliver you. He is faithful to forgive, but do not choose to provoke the Lord and continue living in sin. If you do, you will be destroyed in God’s wrath that is on the way, and will ultimately burn in hell. The Lord is no longer listening to halfhearted repentance. We must turn from our sins, or we will be destroyed. Matthew 23:14King James Version (KJV)14 Woe unto you, scribes and Pharisees, hypocrites! for ye devour widows’ houses, and for a pretence make long prayer: therefore ye shall receive the greater damnation. Matthew 10:14-15King James Version (KJV) 14 And whosoever shall not receive you, nor hear your words, when ye depart out of that house or city, shake off the dust of your feet. James 3:1King James Version (KJV)3 My brethren, be not many masters, knowing that we shall receive the greater condemnation. 2 Peter 2:20-22King James Version (KJV)20 For if after they have escaped the pollutions of the world through the knowledge of the Lord and Saviour Jesus Christ, they are again entangled therein, and overcome, the latter end is worse with them than the beginning. 21 For it had been better for them not to have known the way of righteousness, than, after they have known it, to turn from the holy commandment delivered unto them. 22 But it is happened unto them according to the true proverb, The dog is turned to his own vomit again; and the sow that was washed to her wallowing in the mire.